Before I get started here, just some things I forgot from the Virgins. We had a big achievement (at least to us). Because boats have a number of kinds of metals (stainless steel, alumimum, regular steel, bronze) in them, and because salt water creates a simple battery within which the least `noble`metal gets eaten away (not a good thing if it is your propeller shaft, for example) it is necessary to have one or more sacrificial zincs. Zinc is a metal that is more prone to be eaten than other metals and hence protects them. We only have one zinc which is a doughnut that is bolted to our propeller shaft. I suspected that we needed to put a new one on and I was right, the old one was totally gone. Before hiring a diver to do this, I thought we would have a go at it ourselves. This is a tricky business using just snorkels and masks since the zinc comes in two halves that must be attached by two bolts with Allen sockets - so you have five items to deal with including the Allen wrench and all while you are holding your breath. We worked out a system where June would dive down with half the zinc a second or so before I went down with the other half and a bolt and wrench. Anyway, it worked and we did not drop anything so we are zinced for the next few months. I bought a prescription dive mask for snorkelling (after doing the zinc). I had looked at these in a dive shop in Canada and it was going to be something more than $300 but the dive shop at the marina had a set up for US$120 including the strongest lenses they had (which were almost strong enough for me). I know see a lot more fish and stuff than before. Too bad I didn`t have this mask when June saw the shark in St John! Finally, June got run over by a dinghy while snorkelling and ended up with several scrapes on her arm from the boat's rough bottom. Could have been much worse since there was an outboard motor involved. 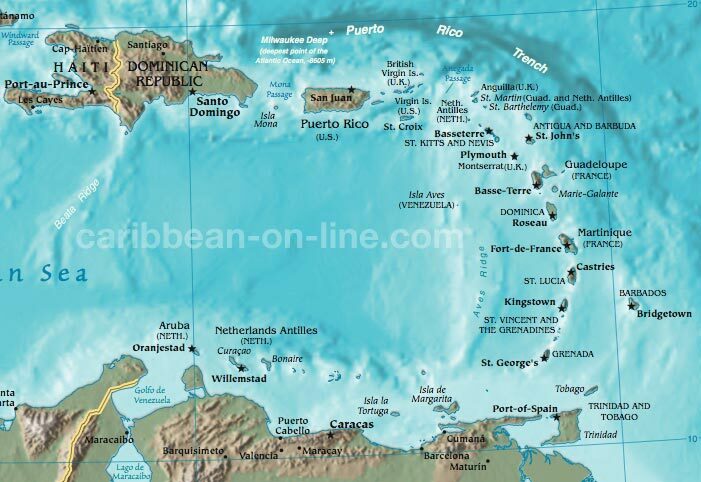 Our cruising guide books lay it out pretty clearly - we have the Virgin Islands, the Leeward Islands (from Anguilla to Dominica in the map below), and the Windward Islands. When you are in the Virgins these could be called the Windward Islands and really Windward Islands. After getting to the Virgins from the US, there is really one long sail left and that is to get to the long island chain to the east. The distance is not huge, about 80 miles but it is to windward so a difficult sail. The forecast was for winds from the ENE. On the map you can see that getting to St Martin or St Barts is a tougher sail (more to windward) than going to Saba or St Kitts. The distance is such that it requires an overnight sail. We left Virgin Gorda in the BVI around noon and it quickly became apparent that the wind was not ENE and was barely from the east so we spent the next 22 hours hard on the wind. This was followed by four hours of motoring to get to Basseterre, the capital of St Kitts and Nevis (Basse-Terre is the capital of Guadeloupe and there are at least a couple of islands called Basse Terre). Getting this far means that we can go all the way south with day sails alone. From here we will go to Montserrat and then Guadeloupe (each about 35 miles apart) and on a good point of sail as long as the wind is no worse than east or even a tad south of east. Just a few notes about St Kitts and Nevis. A few years ago they had a referendum on dividing into two countries. The vote in Nevis was 62% in favour but it was decided before hand that they needed a two thirds majority for separation (a good lesson for Canada perhaps). The result would have been the creation of the least-populated country in the western hemisphere - 12,000 Nevisians. BTW, Nevis owes its name to Columbus who saw the large mountain here with a layer of cloud over its summit and called it Nuestra Senora Dos Nieves (sorry for the spelling errors) Our Lady of Snows. Here we are in Nevis - just wanted to include this for those in northern climes where I hear that snow has begun already. After Nevis we will be going to Montserrat and Guadeloupe. The former will be interesting because the volcano there is still quite active and have of the island and adjacent waters are an exclusion zone. The Montserrat Volcano Observatory (http://www.montserratvolcanoobservatory.info/) indicates that this week has been pretty active volcano-wise - a 3 on their five-point scale. It will be interesting to see what it is like. BTW, the website is worth a visit. Guadeloupe will be interesting because of the food and because of the intriguing combination of France and the Caribbean that we will find there. Posted by Bruce at 6:04 p.m.